Almost all Americans know about the United Nations, but few know about Agenda 21, or the US government’s implementation of UN policies. The UN issued several policies at the 1992 Earth Summit, one of which was the Convention on Biological Diversity (CBD). Compliance with this UN policy is being driven and managed by the Wildlands Network which shares the same goals as the CBD; to set aside half the land in America for animals. But let’s reframe this issue just a bit and put it into perspective; is there any reason you would turn over half of America to Vladimir Putin? What is the difference between living under Putin’s rule or living under UN rule? We are giving the eco-socialists our land (the agencies buy it with our taxes) and we are sliding down the slope to living under UN rule. In Florida, the government has acquired 28% of the land (9.9 million acres), so the UN’s work is already better than 50% done in Florida! The process of returning land to its wild state is referred to as “re-wilding.” Wildlands are created by buying land, reducing or eliminated human activities and access to the land, and then putting buffer zones around them. Then another wildland is created nearby, and they connect them with more land purchases. This accumulation of land begins to form corridors, and the corridors then connect to one of the four North American Wildways (migration routes). This project is supported and managed by eco-socialists like the Sierra Club, and The Nature Conservancy which brokers land deals, and often works with the USF&WS to obtain and transfer land. The ultimate goal is to erase any sign of human activity (houses, roads, trucks, etc. ); therefore, humans will be pushed out of wildland areas. Figure One shows the UN’s plan for America. We will be living in the black areas (human settlements), while most of the land will be off limits to humans (red, orange, yellow). In 2010, House Resolution HR 5101 the ‘‘Wildlife Corridors Conservation Act of 2010” was introduced, and didn’t make it into law, but it provides an insight into the thoughts of our politicians. The EPA helped out when they started promoting the Wildlands Network on their site. In 1999, the Florida legislature passed the Florida Forever program which authorized $3 billion in bonds to purchase land. In 2008, the program was reauthorized with an additional $3 billion in bonds to conserve land. The Florida Forever program has provided $6 billion for the acquisition of land. There are four Wildways in North American, including the Eastern Wildway, which extends into the Everglades. It is doubtful Floridians would be approving these expenditures if they knew the real goal of these land purchases. 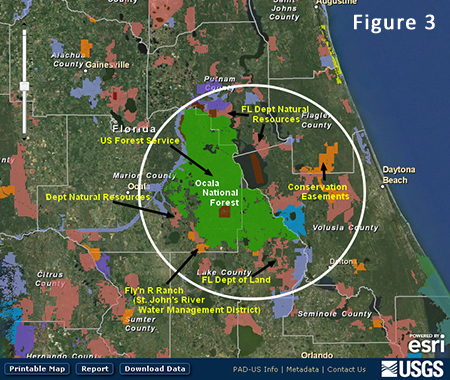 Figure Three, shows the land purchases around the Ocala National Forest by numerous government agencies. 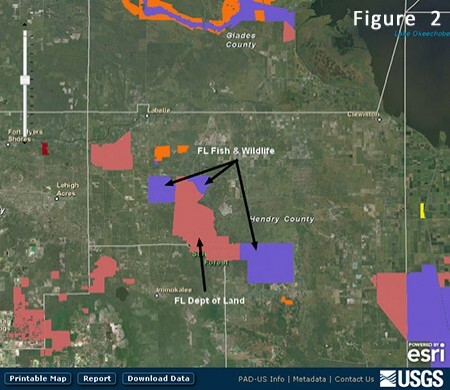 Figure Four, shows lands designated for environmental use in the State of Florida. Floridians have given 28% of Florida (9.9 million acres) to the government. Unless we stop these government land acquisitions we will all end up in apartments located on a little black dot known as a human settlement, as presented on Figure One. 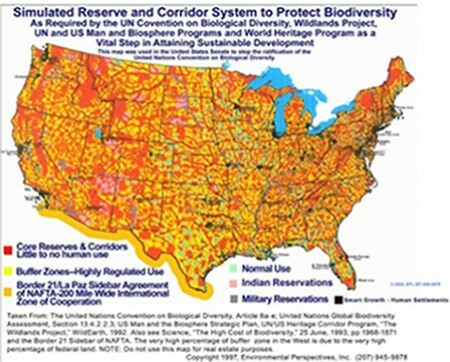 Politicians of both parties, and agencies at the federal and state levels are working together to create the UN’s vision of controlling 50% of America, and the federal government already owns about 50% of the western US. Karl Marx wrote, “The theory of Communism may be summed up in one sentence: Abolish all private property.” The UN and their eco-socialist ilk have pledged to take our land and our freedom, and the people in our government are helping them! All property owners should ask themselves if they would prefer to control their own land, or would they prefer their land be managed by a global management system of government experts? The socialists have been working unimpeded for years, and it is apparent freedom loving Americans need to play catch-up. We cannot rely upon, or trust, our government or politicians to do it for us. There is a new paradigm we must accept; only we the people can stop this. Ted Turner owns as much land as the Federal Government. It is rumored he is importing dangerous human averse animals to prevent visitors from invading his private lands. What kind of dangerous animals?